VANCOUVER — They remember what it was like when they were elementary school students, wondering about high school, anxious about their future. As the years went by, their future became their present but they have not forgot about their past. 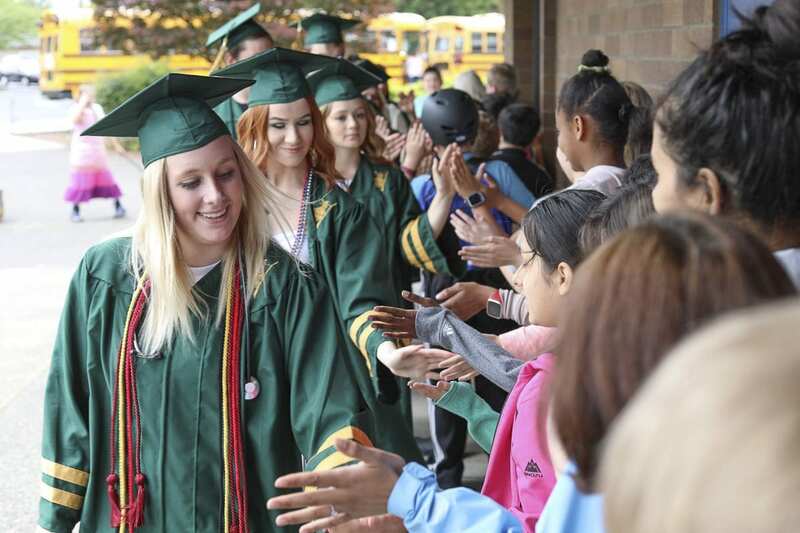 Last week, close to 150 soon-to-be graduates from Evergreen High School went on a tour of neighboring elementary schools and one middle school to encourage young students, to let them know there is a finish line for primary education. Crossing that line with their friends is a worthwhile journey. Modeling their caps and gowns that they will wearing for their commencement ceremony, the high school students were treated like conquering heroes with high-fives, fist-pumps, parades of sorts, and celebratory music. 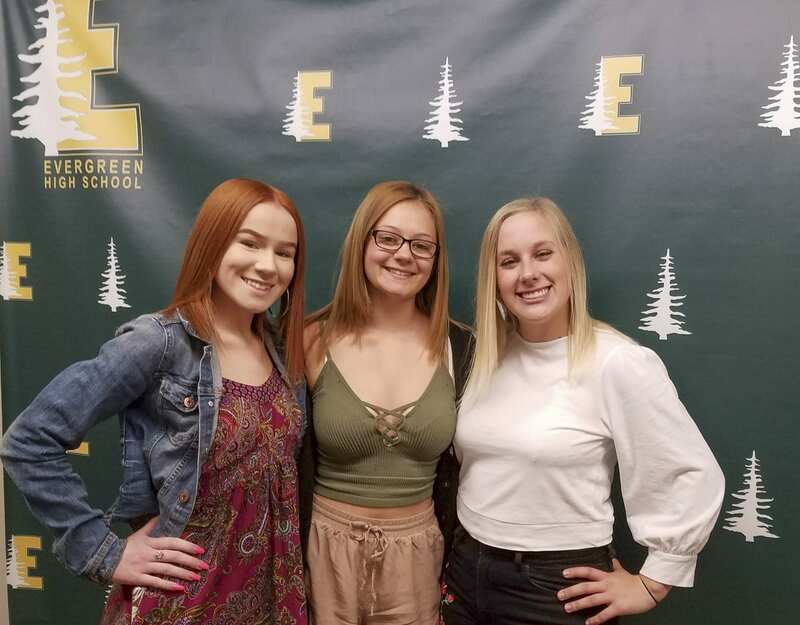 Three of the graduates-to-be from Evergreen who went on tour last week shared their experiences, all agreeing that the visits were good for both parties – the younger students and the high school seniors. For Ciara Lawrence, it was also a chance to experience another gathering for the Class of 2018. “It was one of the last things that most of the seniors would be able to do together, and I wanted to be part of it,” she said. The tour had stops at Burton, Fircrest, Image, Endeavour, Hearthwood, and Mill Plain elementary schools as well as Cascade Middle School – feeder schools into Evergreen. Reuben Dohrendorf, an associate principal at Evergreen, said there are three reasons for the tour: to celebrate Evergreen’s graduates, to inspire the younger students, and to get the younger students excited about becoming Plainsmen. All of the high school students volunteered their time. The only requirement was being a senior in good academic standing, preparing to graduate. Duncan, who took anatomy and physiology classes at Evergreen, wore her stethoscope on the tour, so students would ask her about it, to start a conversation. “When I was in elementary school … to me, high school was scary. I was curious as to what it was going to be like,” Duncan said. She said she did not have anyone from the high school visit her when she was a youngster. “That would have been the coolest thing ever,” she said. Her advice: Get involved and have fun. Kinkead recalls the dread associated with worrying about her future. “I was always like, ‘Ugh, I have another seven years of school left?’” she said. Last week, she was able to tell today’s younger students that it will go fast. To make it more memorable, she advised students to get involved in sports and leadership. “It makes school more fun,” she said. She said she wished older students had talked to her when she was in elementary school. Now, Lawrence understands there is nothing to be scared of at Evergreen, if you go into high school with the right attitude. Be open to friendships with any and all. “No one is ever left out of anything,” Lawrence said of Evergreen’s philosophy. Kinkead said being involved in leadership led to her making friends for life. Oh yes, that is another solid piece of advice from the soon-to-be graduates. Teachers are there to help. Duncan had a medical issue that caused her to miss quite a number of school days. Her teachers called her regularly, just to see how she was doing. “A lot of teachers do a lot for students,” Kinkead added. The students all remember what it was like when they were 10 years old, worried about going to middle school and then high school. Now as soon-to-be graduates at Evergreen High School, they hope to have eased some concerns. There will be challenging days ahead, but if students work hard, trust their teachers, and rely on one another, they will graduate one day with memories for a lifetime.